This article is about the Socialist Party of Flanders, Belgium. For other uses, see Socialistische Partij (disambiguation). Socialist Party Differently ( Socialistische Partij Anders, sp.a) is a social-democratic Flemish political party in Belgium. The party, formerly known as the Belgische Socialistische Partij (BSP) 1978–80 and the Socialistische Partij (SP) 1980–2001, emerged from the Belgian Socialist Party linguistic and community split in 1978 which also produced the Parti Socialiste; the Belgian Socialist Party was itself formed by former members of the Belgian Labour Party. From December 2011 to September 2014, sp.a was part of the Di Rupo Government, along with its Francophone counterpart Socialist Party (PS). Sp.a has been part of the Flemish Government several times. The party was the big winner in the 2003 election, running on the SP.A-Spirit joint list (cartel) with the social-liberal party Spirit. Their share of the vote went up from 9% (of the total Belgian vote) to almost 15%, a second place in the number of votes. The main victim of this resurgence was the Green! party (formerly known as Agalev). The sp.a was part of the "purple" federal coalitions of Prime Minister Guy Verhofstadt from 12 July 1999 until 10 June 2007, which contained both the Flemish and Francophone liberal and social-democratic parties. In 2004, the sp.a along with its partner Spirit lost the elections for the Flemish Parliament. 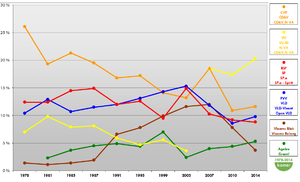 Although they won more seats in comparison to the Flemish elections of 1999, their percentage of the vote compared to the successful 2003 federal elections was considerably down. The reputation of then party leader Steve Stevaert took a beating too. The party was briefly led by Caroline Gennez, after former president Steve Stevaert left to become governor of Limburg. Johan Vande Lanotte, who served as Minister of the Budget in the federal Government, was elected President and resigned as minister to become President on 17 October 2005. He resigned 11 June 2007, after sp.a-Spirit lost the elections for the federal parliament of 10 June 2007. In these federal elections, the cartel won 14 out of 150 seats in the Chamber of Representatives and 4 out of 40 seats in the Senate. Afterwards, Caroline Gennez was elected President by the party members. As of May 2009, sp.a was in opposition in federal politics; and unlike its Francophone counterpart the Socialist Party (PS), sp.a was not a participant in the Leterme II Government. In January 2009 the party had apparently changed its name to Socialisten en Progressieven Anders. This name change was however retracted, and the party baseline instead was changed from "Sociaal Progressief Alternatief" to "Socialisten en Progressieven Anders". In the 2010 federal election sp.a won 13 seats with 9% of the overall vote. The party was a member of the Di Rupo Government formed on 6 December 2011, until the elections in 2014. In the elections for the Chamber of Representatives on 25 May 2014, sp.a scored again 9% and received 13 seats, in contrast to their francophone Socialist Party counterparts, who lost 3 seats and whose share of the vote decreased by 2%. In the Flemish Parliament sp.a have 18 representatives, deriving from around 14% of the vote - this is a small reduction on the 2009 parliament, where sp.a had 19 seats, deriving from 15% of the popular vote. From 2009-2014, sp.a participated in the Flemish Government, in an uneasy coalition with the CD & V and the N-VA. From 2014 onwards, sp.a formed part of the opposition in Flanders, as the regional government reflected the Flemish component of the federal administration, consisting of coalition of the Open-VLD, CD & V and the N-VA.
° In Limburg sp.a formed a cartel with Groen. The main six Flemish political parties and their results for the Chamber of Representatives. From 1978 to 2014, in percentages for the complete 'Kingdom'. Johan Vande Lanotte (2010), Vlugschrift – over welvaart en geluk, (retrievable on the website sp.a-ledenbeheer[permanent dead link]), 96 p., ISBN 978-90-486-0629-0. Patrick Vander Weyden & Koen Abts (2010), De basis spreekt — onderzoek naar de leden, mandatarissen en kiezers van sp.a (research on members sp.a by Ghent University), Acco (Leuven/Den Haag), 239 p., ISBN 978-90-334-7571-9. ^ "Open VLD heeft de meeste leden en steekt CD&V voorbij". deredactie.be. 30 October 2014. ^ "Open Vld telt meeste leden". De Morgen. 30 October 2014. ^ a b Nordsieck, Wolfram (2014). "Flanders/Belgium". Parties and Elections in Europe. Retrieved 5 October 2018. ^ a b Hans Slomp (30 September 2011). Europe, A Political Profile: An American Companion to European Politics. ABC-CLIO. p. 465. ISBN 978-0-313-39182-8. Retrieved 23 August 2012. ^ a b Dimitri Almeida (27 April 2012). The Impact of European Integration on Political Parties: Beyond the Permissive Consensus. CRC Press. p. 71. ISBN 978-1-136-34039-0. Retrieved 14 July 2013. ^ a b Ari-Veikko Anttiroiko; Matti Mälkiä (2007). Encyclopedia of Digital Government. Idea Group Inc (IGI). p. 397. ISBN 978-1-59140-790-4. Retrieved 18 July 2013. ^ a b Cas Mudde; Cristóbal Rovira Kaltwasser (28 May 2012). Populism in Europe and the Americas: Threat Or Corrective for Democracy?. Cambridge University Press. p. 27. ISBN 978-1-107-02385-7. Retrieved 30 July 2013. ^ Josep M. Colomer (24 July 2008). Comparative European Politics. Taylor & Francis. p. 220. ISBN 978-0-203-94609-1. Retrieved 13 July 2013. ^ "Vande Lanotte gooit handdoek in de ring" (in Dutch). VRT. 11 June 2007. Retrieved 12 June 2007. ^ a b "sp.a partijvoorzitters". Tijdslijn.s-p-a.be. Archived from the original on 9 October 2009. Retrieved 19 June 2010.